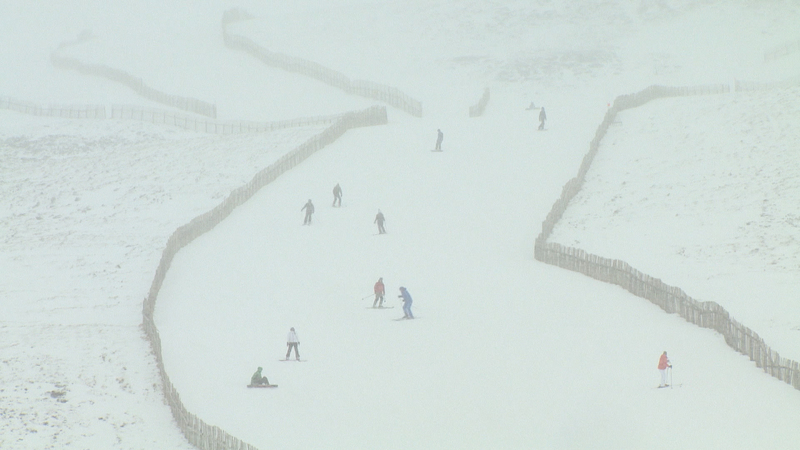 Scotland's mountain snowsports resorts are having one of their toughest winters in years. Mild weather has reduced opportunities for skiing and snowboarding at Glencoe Mountain, Nevis Range, Cairngorm, Glenshee and the Lecht. Iain Cameron, an expert on snow, said this winter was among the most snowless of the last 70 years. However, Scotland's snowsports industry remains optimistic of colder and snowier weather in spring. The resorts have been using snowmaking equipment to guarantee skiing and snowboarding on runs at lower levels. 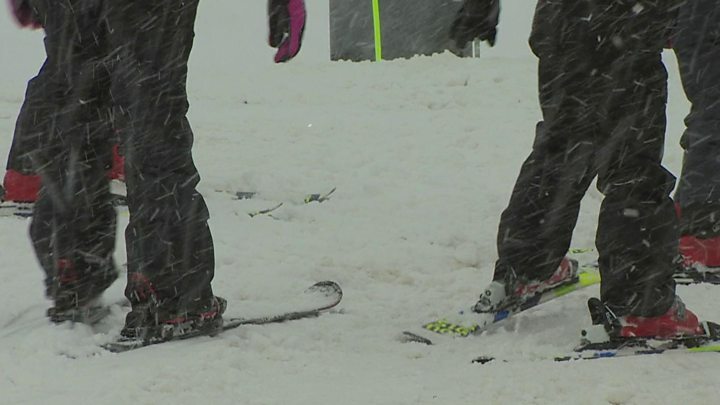 Trafford Wilson, chief executive of Snowsport Scotland, said: "With snow not arriving in any real form until late January, most snow resorts have been finding it difficult to get going this season." He said the mountain resorts had been working "really hard" to try and keep ski runs active in the challenging conditions. Mr Wilson said: "Snowmaking at Glencoe, the Lecht and Cairngorm have allowed lower mountain runs to operate. "However, a combination of rain and mild temperatures over the last two to three weeks has put a number of resorts on hold until more snow cover arrives." The way previous seasons have progressed offers some hope to the snowsports industry. Mr Wilson said it had been possible to ski in Scotland until early May last year. He said: "History would suggest that April is the best skiing month in Scotland, as the spring temperatures cool off and the weather settles. "Fingers crossed for cooler temperatures and snow fall in the coming weeks." Glencoe Mountain is to hold the Red Bull Homerun on 13 March. The competition, which is to be held for the first time in the UK, involves entrants making a sprint for their skis or snowboard and then sliding the rest of the way to the finish line. Andy Meldrum, of Glencoe Mountain, remains hopeful for the rest of the season. He said: "It has not been the best ski season but it looks like colder weather on the way from the start of March, so there is still time for it to come good." Like the Lecht, Glenshee and Cairngorm, Glencoe has been manufacturing snow so it can offer snowsports on lower slopes. Mr Meldrum said: "We currently have an area of Snowfactory snow for beginner ski and snowboard lessons and sledging and expect to be able to maintain this in the coming weeks despite the very unseasonal temperatures." The Lecht in Aberdeenshire has been manufacturing snow since November. Operations director James McIntosh said the centre was enjoying a "fantastic season" after he and the other directors took "the gamble" to invest in snowmaking equipment. He said: "The challenge is trying to keep production above the snow melt and concentrating on one of the runs. "We can produce 50 tonnes in 24 hours and then spread that snow onto the slope." 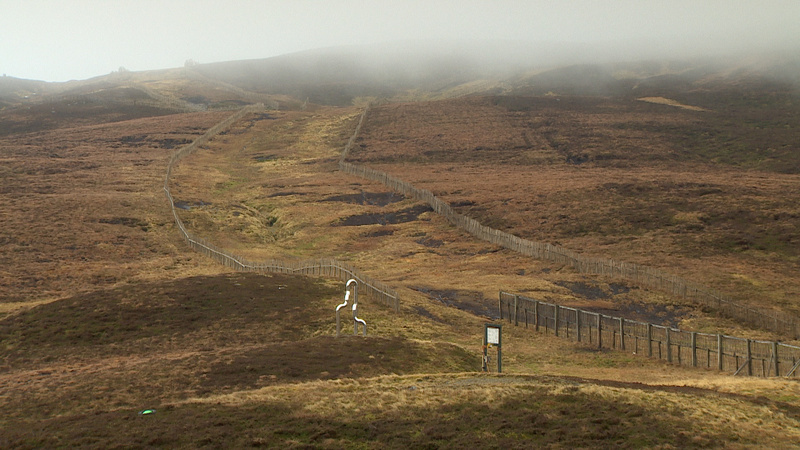 David Farquharson, at Glenshee, said it had been a difficult season so far, but it was far from over. He said 22 days of snowsports had been possible so far, while last year the centre enjoyed an above average of 109 days. Mr Farquharson said: "Had we not had manmade snow we probably would have had a couple of days with one of our lifts. "But we are still hopeful. It is still a long way to Easter." Snow expert Mr Cameron, whose research on snow in Scotland is published by The Royal Meteorological Society, said there had been a lack of the white stuff this winter. He said: "Winter 2018/19 is, as we speak, amongst the most snowless of the last 70 years. "The last comparable February where we had so little present on the hills was 1998, which itself was the least snowy February since before 1954. "Save for a few Atlantic storms in January, which brought deep snow to the north west Highlands, mild and relatively dry conditions have ensured that most other hills over 3,000ft (900m) have only large drifts." Mr Cameron said Britain's highest mountain Ben Nevis had far more rock exposed on its north east face than could "reasonably be expected" for the time of the year. He said a massive "wreath" of snow that forms at the base of one of the mountain's major gullies was more akin to how it looks in June than February. Mr Cameron added: "As usual, the Cairngorms are hanging on to more snow than anywhere else in Scotland. But, even here, conditions are very thin. "With temperatures forecast to hit 18C over the next few days, there would appear to be no prospect of any white stuff falling until well into March."